It was with great sadness that we learned of the passing of René Kouassi in early January 2019. Kouassi, an economics professor from Côte d’Ivoire, was the director of economic affairs at the African Union Commission, a post he occupied since 2003. He was a strong defender of Africa’s regional integration. 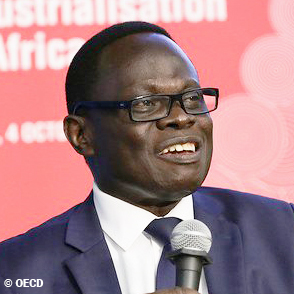 In 2018, Kouassi initiated the Africa’s Development Dynamics series, the new joint flagship publication of the African Union Commission and the OECD Development Centre. For more than a decade, Kouassi was in charge of overseeing the work of four AU divisions, namely economic policy and research, private sector development, statistics, and regional integration and co-operation. Kouassi started his academic career at the University of Abidjan in 1985, where he worked as a lecturer and researcher for more than a decade. Kouassi obtained a post-graduate diploma (DEA) in economics from the University of Clermont-Ferrand in France (1985) and a PhD in development economics from the University of Versailles (1995).